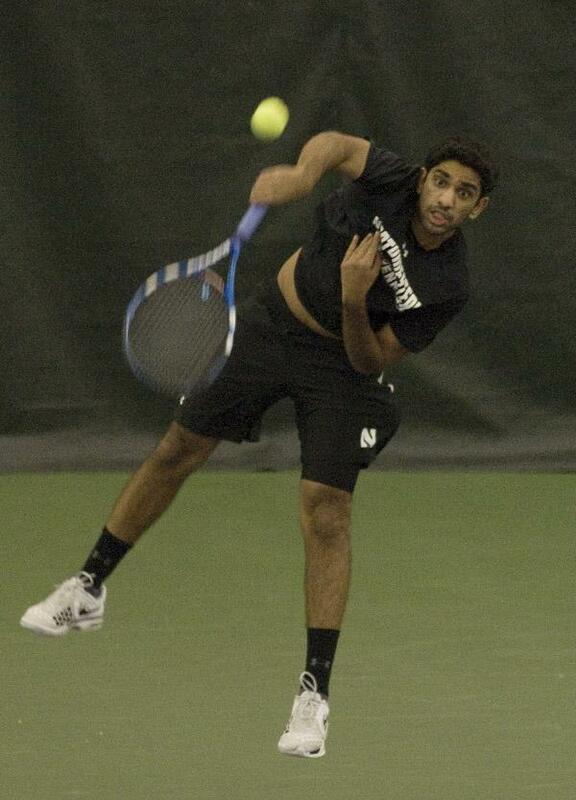 Senior Sidarth Balaji serves during a recent home match. The Wildcats have their highest ranking as a team in nine years. The last time Northwestern was ranked No. 33, Facebook was one month old and Roger Federer held two major titles. A snappy start to the season has put the Wildcats at their highest ranking in nine years. With only one loss so far coming from No. 9 Duke, NU has more than proven itself to be an unyielding opponent. But the No. 34 Cats’ early success this year has not come out of nowhere. NU saw its best season in three years during 2012, when the team went 7-4 in Big Ten play and qualified for the NCAA tournament for the first time since 2009. With their non-conference season now fully underway, the Cats have simply picked up where they left off last May. Tenacity in three-set matches has already paid off significantly for NU in the first part of the season. In their nine dual matches so far, the Cats have won 75 percent of their singles matches when pushed to a deciding set. But the Cats’ success in doubles has been key to giving them the advantage when they take to the singles court. During last year’s season, NU won nearly 60 percent of its doubles matches in Big Ten play. In their 26 dual matches, the Cats won the doubles point 15 times and went on to win the match 13 of those times. They were only able to win twice without winning on the doubles court, taking out Minnesota 4-3 and Purdue 5-2. A more aggressive game plan in return games has helped put NU in a winning position. And this year has been no different. An 8-1 record perfectly mirrors NU’s 8-1 doubles tally. A busy weekend for the Cats begins on Friday with No. 40 Vanderbilt, a team that narrowly defeated the Cats 4-3 last year in Nashville, Tenn.
NU will next face Harvard in the first of two matches on Saturday in the Cats’ third double-header of the season. Last week’s rankings placed Harvard at No. 27 but a loss to then-unranked Old Dominion at home caused the Crimson to suffer a 20-spot free-fall in the new ITA rankings released Tuesday. With a 5-1 lifetime record against Harvard, NU will have the edge going into the match but against a team that is much tougher than the rankings indicate. The Cats will close out the weekend against unranked Valparaiso Saturday night, a team NU has never faced before.